Leeroy is a paladin of the Way of White. The first Undead of the Way of White, Leeroy was also the first pilgrim of the Undead mission to Lordran and to venture into the Catacombs. Near the bottom of the Catacombs, Leeroy can be summoned as a Phantom to assist the Chosen Undead in the fight against Pinwheel. 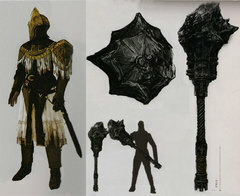 In the Tomb of the Giants, Leeroy appears as an invading Dark Spirit in the relatively well-lit cave before Gravelord Nito, but he does not invade until the Lordvessel has been placed. Leeroy's armor can be found in Gravelord Nito's chamber after defeating his invading phantom. Leeroy wields the mace Grant and shield Sanctus, "legendary weapons of the Way of White, granted to an Undead paladin long ago". Grant's "mass of iron can only be lifted by those with inhuman strength, but it is blessed, and very effective against agents of Dark." Sanctus was "once blessed with the protection of a white flame, but its power has all but faded". Grant A legendary weapon of the Way of White, granted to an Undead paladin long ago. Once blessed with the protection of a white flame, but its power has all but faded, so that it provides only slight HP recovery. Canvas Talisman Medium for casting miracles of the Gods. Paladin Set Armor of Leeroy, Paladin of the Catacombs. Long ago, the Way of the White produced its first Undead, a paladin in golden armor. With the legendary treasures Grant and Sanctus, Leeroy set out for Lordran, Land of the Gods, in the first Undead mission of the Way of White.